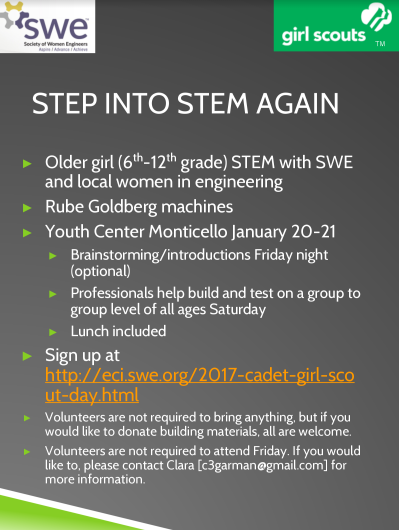 Step into STEM... Again! - Volunteers Needed! Join us as we expand our popular Girl Scout Day to girls at the Cadette - Ambassador levels (grades 6-12)! Friday January 20th, the girls will be having a lock-in.Attendance Friday night is optional. Saturday, January 21st from 8 AM - 2 PM, we will lead them through a hands on Rube Goldberg device building session! They will work though the entire engineering design process and get a feel for what engineering is all about. 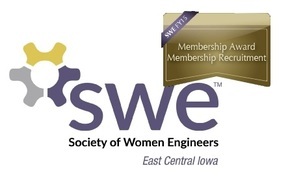 What: Teach high school Girl Scouts about engineering through fun and educational activities. Lunch is provided, and any help is welcome. Please RSVP below! ​Contact Clara Garman at clara.garman@rockwellcollins.com if you have questions.